Here’s something I haven’t done in a while – a first impressions post! While I’ve been using any PR samples I’ve been sent and products that I’ve bought, I’ve been really bad at actually sitting down and writing reviews for them on here. Time for that to change! When I returned from Barcelona last Sunday, sitting on my bed were the new Summer releases from Models Own, and I got pretty excited about them. For me Models Own can be a bit hit and miss. Some things I LOVE (brushes, nail polishes, liners) and some things I’m not too keen on (palettes, some face powder products) but for the most part the Sculpt and Glow products are impressing me more than I expected. I was apprehensive about the Highlighter Powder because I don’t actually like Models Own highlighters all that much. They’re a bit too powdery for me. That said, I do like this product a lot and I definitely think it’s worth £9.99. You get five different colours, all of which are large enough in the pan to pick up individually with a brush or your fingers. And let’s be honest, looks do matter with product and I think this Highlighter Powder does look really pretty. The three highlighter shades are lovely (although the lightest does show up white on me slightly) and I’ve been using the light gold shade all week. It’s a beautiful shade to use if you’ve got a tan. However I do not like the pink blush shade or the bronzer shade. Shimmery bronzers just don’t do it for me and this one’s a little bit too orange for my skin tone. Same goes for blusher – I’m a matte blusher girl – although I can imagine this would look lovely over the top of a pink matte blusher. Good news is I’ve got less to say about this one! You might think this is less exciting and to be honest. compared to the highlighter powder it might be, BUT it’s a really interesting product from Models Own. I think this could possible be a cruelty free, budget friendly dupe for the Chanel Soleil Tan de Chanel. The Creme To Powder Bronzer isn’t too orange for those of us who are pale and it’s pretty sheer so you can build it up to give you as much or as little tan as you’d like. I’ve been applying this before powder with the Stippling Brush Models Own sent me and it’s lovely over foundation (it doesn’t look patchy or anything) and on bare skin. There are four new shades launching. Models Own were kind enough to send me two (Naked and Deep Berry are the others). I used these in my Pool Party look. Whisper is a no no for me – it’s very difficult to get an even application on your lips. The white in the formula (because it’s a pastel pink, it’s got some white pigment in there) probably causes this, and you’ll find that similar pastel shades do this too. Kiss on the other hand applies really well and doesn’t bleed or smudge at all once it’s dried down. Even with the gloss on top it didn’t come off. I will find a use for the Fan Brush – and it is a nice, super soft one at that – even though I don’t like them for highlighting. Fan brushes were originally meant for removing excess powder so I’ll probably use this for looks when I decide to bake. The Stippling Brush is super soft and light. It’s not as dense as some of my other brushes that look similar to it, which makes it perfect for applying the bronzer. You could also use it to apply foundation if you’re a fan of lighter coverage. For the price, Models Own brushes are great quality and I’d definitely recommend them. All of these products are available to buy now online and in stores. TLDR: Lovely Summer range from Models Own. Surprised how much I like it. Definitely get Creme To Powder Bronzer, brushes & Kiss Lix Liquid Lipstick. 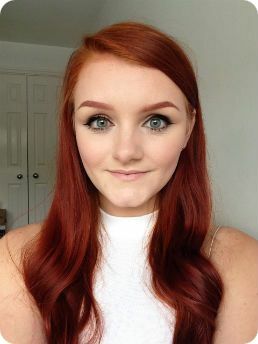 I'm Phee, I'm 26 years old and I run Phee's Makeup Tips blog! I post makeup looks, reviews and tutorials. Recent convert to expensive skin care.